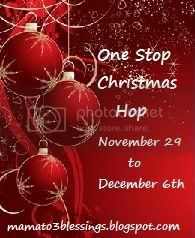 Excited to announce that this year I will be taking part in the One Stop Christmas Hop! I cannot wait for the event to start! I am hard at work finding a great prize for my readers 😉Are you a blogger and want to be apart of the hop simply click on the button above and sign up. There are currently 44 bloggers that have signed up and are offering a prize worth $25 or more. There is still more time to sign-up, hope you are able to participate.